Adorable Addie was saved today by our founder and clearly she could not have been happier than to jump in their arms! 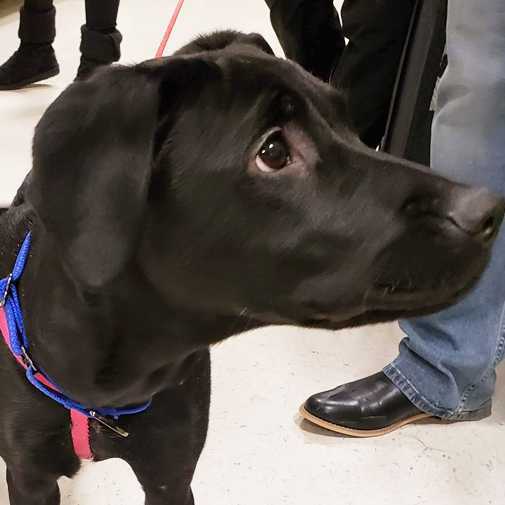 This sweet, 5-month-old black lab mix was left abandoned at a shelter and after spending time with her, we have no idea why! Addie is friendly and ready to be with a family who will love her forever! Want to adopt Addie? If you are viewing this bio listing on Petstablished, click the ADOPT button to fill out our adoption application. If you are viewing this bio on another pet adoption site, please click on the link that follows or copy and paste the Dog Adoption Application link into your browser and then choose "Addie" from the dropdown menu of adoptable dogs: https://www.petstablished.com/adoption_form/11685/generic.